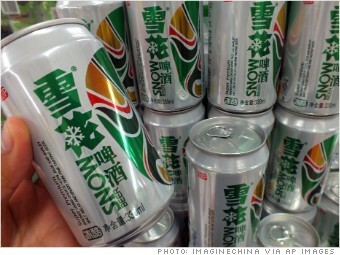 Chinese drinkers guzzled 10.7 billion liters of Snow in 2014, making it the world's No.1 beer. Keen to try it? You'll have to jump on a plane to China -- the only country where Snow is sold. Snow is produced by SABMiller (SBMRF) and local partner China Resources Enterprise. Last year, the brand had 5.4% of the world market. But before you buy a ticket to Beijing, consider the taste. Snow is a lager, and a prime example of the mostly flavorless -- but refreshing -- beer that dominates in Asia.